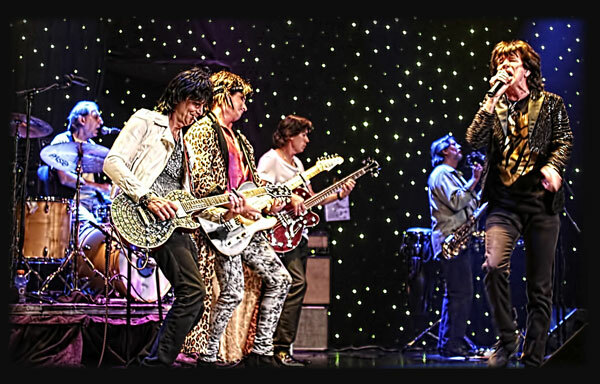 The Ultimate Stones is a Rolling Stones tribute band that recreates an exciting Rolling Stones concert experience with an all look-alike cast of performers. The sights, sounds, energy and attitude that IS The Rolling Stones is all there. They have become best known for pulling out the theatrical stops, raising the bar for all Rolling Stones impersonators with it’s array of musical and vocal talents. The Ultimate Stones does not use backing tracks of any kind to fill in the instrumentation but rather employ all the ingredients necessary to reproduce some of the rock world’s best known recordings. A real sax solo in Brown Sugar. Real piano on the timeless Angie. Lush four and five part harmonies. Duets like Christina Aguilera and Mick Jagger on “Live With Me”, from the Martin Scorsese concert film “Shine A Light”, and Merry Clayton or Lisa Fisher killing it on the enduring “Gimme Shelter”. The Ultimate Stones hail from southern California and perform extensively throughout the area, are frequent visitors to Las Vegas, the entertainment capital of the world, and travel wherever good Stones music is wanted to put on a show rivaled only by the real deal themselves. Don’t miss your next opportunity to catch The Ultimate Stones! Wanna Book The Ultimate Stones? You can book The Ultimate Stones for your next event just by clicking the "Book Them Now" button to the right and filling out the form. We will be in contact with you about their availability as soon as possible.